World War II actually started on the first of September 1939 when the German army attacked Poland. On August 23, 1939 the German-Soviet agreement stipulated that Lithuania would be under the German jurisdiction, but that same year, in September 1939, it was decided by Germany and the Soviet Union that Lithuania will become a state under the Soviet jurisdiction. According to this agreement on October 10, 1939 Vilna, including a 9000 square kilometer area (about 20 miles by 20 miles) around the town was returned (from Polish occupation) to Lithuania by the Soviet Union, and Soviet troops were allowed to establish bases all over Lithuania. On June 15, 1940 Lithuania was forced a regime to form that was friendly towards the Soviet Union. When the new government was formed, headed by Justas Paleckis, the Red Army took over Lithuania. As a result the President of Lithuania Smetona fled, and the Lithuanian leaders were exiled to Siberia. The parties were disbanded. The popular Seimas was elected, 99% of its members were Communists. The Seimas unanimously decided that Lithuania would join the Soviet Union. Following new rules, the majority of the factories and shops belonging to the Jews of Ponevezh were nationalized. Houses occupying over 220 square meters (about 2400 square feet) , many of them Jewish, were nationalized too. All the Zionist parties and youth organizations were dismissed, and several of the activists were detained. The "Komsomol" (The Communist Youth Organization) started to mobilize youth into its lines. 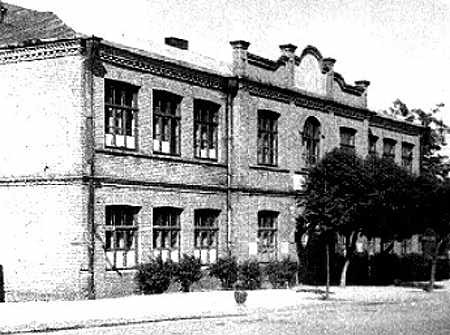 Instead of the three Kindergarten- "Tarbuth", "Yavneh" and the Yiddish one - a united Yiddish Kindergarten was established with 160 children and housed in two buildings. All the Jewish elementary schools were united into two. The High Schools were concentrated in the building of the "Yavneh" high school and about 600 pupils studied there in two shifts. The name of it was "The third governmental gymnasium with instruction language Yiddish". The "Peretz" library moved into a spacious flat on behalf of the "Folkshilf" (Popular Help) and a reading room opened. The building of the Yeshiva was taken over by the Russians and its students wandered from place to place. Jewish Communists who emerged from underground activities, were given important jobs in the civic sector. At the beginning of June 1941 at least 27 Jews, the owners of nationalized factories and shops and Zionist activists were exiled deep into Russia. The others sat "on their suitcases" and awaited their turn. The German army entered Ponevezh on the of June 26, 1941, 5 days after the German invasion of the Soviet Union. Even before a single German soldier was seen in town, the Lithuanian nationalist activists started to insult and abuse Jews. Behind these activities there were several people from the Lithuanian intelligence in town, like the principal of the high-school, the deputy of the district prosecutor, the secretary of the provincial court and others (their names are preserved in the Archives of Yad-Vashem in Jerusalem). They organized the local students who were subsequently involved in the majority of the murders of Ponevezh Jews. On the of July 4, 1941 a call to the local Lithuanian population was published in the periodical "The Liberated Ponevezh Citizen" stating: "help the German army to clean our forests and groves of Jews, Bolsheviks and other strangers (foreigners), including Lithuanian traitors as fast as possible. So your lives and properties would be saved." The Jews were now required to report daily at various locations throughout the town from where they would be taken for various work assignments in the immediate area. One group of young and fit men were taken away and given "the job of digging peat in the countryside." None of them ever returned. Every day, local Lithuanian policemen would arrange a "show". They would march groups of Jews through the streets of the town, while continually beating them with whips and rifle butts. Those whose strength eventually failed, had to be carried by others who could still walk. These "performances" would be watched by a large crowd of jeering spectators who would follow the procession all over the town. Many Jewish men of all stages of life were arrested and brought to the local jail where they were cruelly tortured. Every night they would be awoken and forced to crawl around the yard outside on their elbows and knees in the gravel. All the while, the guards would beat them using spiked whips and eventually the wounded prisoners would be bundled on to waiting trucks which took them to either the Kaiserling (Kaizerlingas) (2 km south-east from Ponevezh) or Zalioji (13 km north-east from Ponevezh) forests where they were be murdered by their captors. At the beginning of July the Jews were ordered to crowd together in a Ghetto that was established in Klaipeda, Krekanava and Tulvicius streets. The deadline for the Jews to relocate to the Ghetto was July 11 at six in the evening. The area was fenced off with barbed wire and Lithuanians from the auxiliary police were stationed as guards around the perimeter. It was announced that those Lithuanians who had vacated their homes in the streets set aside for the Ghetto, would receive the Jews' homes in return. Avraham Riklis and Moshe Levit were selected as the leaders of the Ghetto community. The Ghetto also served as a concentration place for Jews who were transferred from Raguva, Ramygala, Krekenava and other towns. After the relocation of the Jews to the Ghetto was completed, 70 dignitaries from the Jewish community were taken hostage so as to ensure that no one would attempt to escape from the Ghetto. Among those arrested were Dr. Golombvik, Dr. I.L. Bornshtein and Dr. Chaim Ben Zion Eizenbud. They were thrown in jail and after a short time transferred to military barracks in the Pajuoste forest. They were subsequently murdered and buried on that spot. Another version about the fate of Dr. Eizenbud is that he was kept in jail and used as a doctor till the final extermination of Ponevezh ' Jews. Terrible atrocities were inflicted on Jews by Lithuanian guards at different workplaces. They broke arms of the Jews with handles of the shovels, while the Jews were forced to deepen a garbage pit. They pushed Jews into a boiling lime pit, they forced Jews to carry barrels of fuel weighing 200 kg (440 lbs.) each, and accompanied them with humiliating screaming and beatings. All these tortured victims were consequently taken to Pajuoste and murdered there. On the August 24, 1941 (first of Elul 5701) the Germans and their Lithuanian accomplices began the final stage of the annihilation of the Jewish community of Ponevezh. They were led from the Ghetto to the execution site at Pajuoste in groups of 200. When they reached the site they were ordered to take off their clothes and to go down on the knees, whereupon the surrounding Lithuanian guards, armed with machine guns and automatic rifles mowed them down with a hail of bullets. As soon as they were shot another group would be brought. Those who refused to go were dragged by the guards who beat them senseless with their rifle butts. Children were wrenched from their mothers and thrown alive into the pits. The murderers would often amuse themselves by throwing babies up into the air and shooting them before they landed on the ground. As most of them were drunk, most of their shots missed the targets and many babies were still alive when they fell into the pits. The murderers lifted out those who had survived by their hair and crush their heads with their pistols. The massacre continued throughout the day and on into the evening. By the next morning the pits were overflowing with corpses. There were several pits of 100 meters (330 feet) long and 8 pits of 50 meters. The victims' clothes were piled up and the murderers would rummage through the heaps choosing whatever items they liked. The filling of the graves was done by Soviet prisoners of war. On one occasion they spotted a child who was still alive in one of the pits. They pulled him out and tried to hide him in the nearby bushes, but the Lithuanian guards spotted them and those prisoners involved were given a severe beating. There were some guards who suggested that the child might be allowed to escape but the militia commander insisted that " the child cannot be allowed to get away. Better to kill him and so ensure that there is no one left to avenge the blood of the Jews". He then aimed his pistol at the child and shot him through the head. By the evening of August 26, 1941 (the third of Elul 5701) the massacre was over and all the pits had been covered. Even after Ponevezh and the surrounding towns' Jews were murdered in August 1941, Jews still were working in the town and at the airport nearby-till summer 1944. Those were Jews brought from Vilna, Shavl, Riga and from Estonia. Among them were Jews who were transferred from the Kovno Ghetto to Riga and Estonia and also Jewish women from Hungary having passed through Auschwitz. All these Jews were transferred to the Shavl Ghetto a short time before its liquidation, and a part of them were transferred to the concentration camps in Germany. Very few survived. 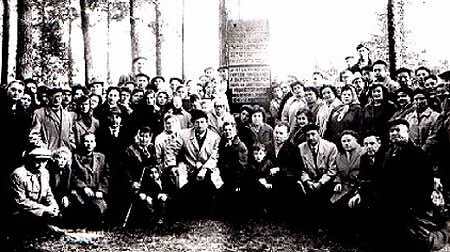 After the war, during the Soviet rule, a monument on the mass graves was erected and on it a Magen-David was placed. This was one of the unique monuments in Lithuania with this symbol on it. The initiator of this monument was Shmuel Feifert from Trashkun. During the war he served in the Lithuanian Division of the Red Army and after returning to Lithuania he devoted himself to the construction of this monument and to getting back Jewish children who were hidden by Lithuanian families and handing them over to Jewish families who were ready to accept them. At the annual meetings of Ponevezh survivors at the Monument on the mass graves at Pajuoste forest. There they would say "Kadish" on the souls of their beloved people and on the pure soul of Shmuel Feifert. 1.Kurganova (Pajuoste) forest- more than 8,000 victims. 2.Kaizerling forest-103 victims, men, women and 48 Lithuanians, members of an underground. 3. Zalioji forest- about 4,500 victims, men, women and children. The Monument on the mass graves at Pajuoste forest. 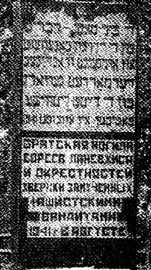 The inscription in Yiddish and in Russian says: "The four mass graves of the Ponevezh Jews who were murdered by the German-Lithuanian Fascists in August 1941." The Monument at the same site that was added later with an inscription in Lithuanain: "At this place the Hitlerists and their helpers in 1941 August killed about 8000 Jewish children, women and men." The Monument on the mass graves at Zalioji forest. The inscription in Yiddish says: "Here, in this place the Nazi murderers and their helpers in July-September 1941 remorselessly murdered about 3500 Jews-children, women, men. Sacred is the remembrance of these innocent victims." The inscription in Lithuanian says: "In this place Nazis and their local helpers in 1941 July-September remorselessly murdered about 4500 people among them 3500 Jewish children, women and men. Let their memories be sacred." After the war some Jews returned to live in Ponevezh, but during the following years most of them left the town; a part immigrated to Israel and maybe to other countries as well. So the numbers were decreasing. In 1959 there were 221 Jews in Ponevezh, in 1989 only 66 were left among the population of about 41,000. In 1971 Avraham Levit, a former Ponevezh Jew, brought a small bag with soil from the mass graves to Yad-Vashem in Jerusalem. In November 1991 a monument was inaugurated at a central square in Ponevezh at the site where the Jewish cemetery was located. The cemetery was destroyed during the Nazi rule and the destruction was accomplished during the Soviet rule. On the monument an inscrption is carved: "At this site until 1972 was the old Jewish cemetery. Let the remembrance of the dead be sacred". At the end of September 1993, at the corner of Krakenava and Klaipeda streets at a remarkable ceremony, a monument made from granite (see the figure below) in the shape of a symbolic gate of the Ghetto, was inaugurated. On the tables of the gate the inscriptions in Lithuanian and Yiddish were carved - "Here was the Jewish Ghetto from the seventh of July until the seventeenth of August 1941. The sculptor of this monument was V.Zigas . The monument at the place where the Ghetto was located. List of Tombstones of Ponivezh Jews Buried at the Old Cemetery in Jerusalem. Avraham son of Yechiel-Michal Shubatsky, 5662 (1902), public worker, manager of "Kolel" Vilna and Zamut till his death, builder of the houses "Beit-Avraham" for the poor, died at the age of 86. List of the Payers of Membership Fees of the "Agudath-Israel" Party in 1913. The Teachers of the Hebrew High-School who received their Education in Central Europe and Russia. Dr. A.Shatz in "Libhober fun Vissen"